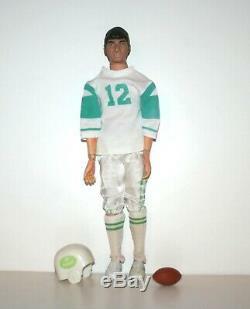 Vintage 1970's Mego BROADWAY JOE NAMATH 12 Action Figure (New York Jets). Vintage item is in decent condition with play wear. His face and hair paint are in good shape with wear. Body is in decent shape with no cracks but the joints are loose (especially the knees) and the feet can come off if pulled. Throwing action seems to work fine. 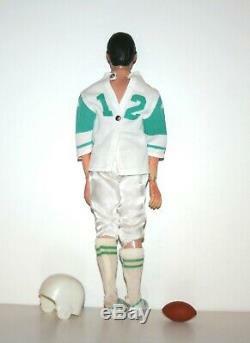 Original jersey is missing the top snap and the pants have a split in the crotch area. Socks have staining and the shoes are both righties. Original helmet is missing the face mask. Not mint, but hard to find figure display well for many. We properly package all of our items so that they make it safely from our business to your home. If you feel an item has not been described properly after receiving it, please let us know before leaving feedback so we can help fix any problems. Please dont send random offers on items unless there is a Make Offer button on it. Thank you as always for shopping at Brogan's Pop Shop! 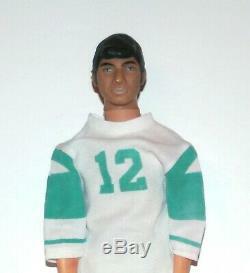 The item "Vintage 1970's Mego BROADWAY JOE NAMATH 12 Action Figure (New York Jets) HTF" is in sale since Thursday, February 7, 2019. This item is in the category "Toys & Hobbies\Action Figures\Comic Book Heroes". The seller is "broganscardshop" and is located in Rio Grande, New Jersey.